2019-02-08 scienceAntarctica, Ars Technica, glaciers, ice sheets, science, sea level riseM.C. One of the most shocking climate science studies in recent years came in 2016. 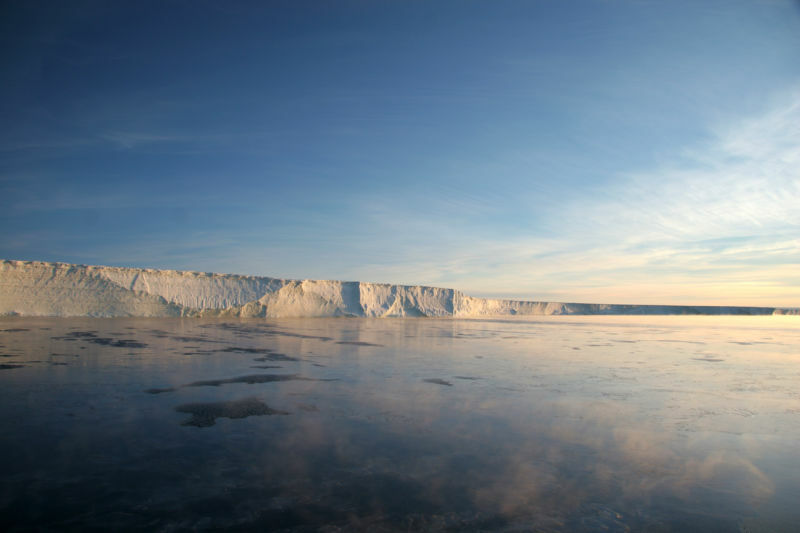 That study, from David Pollard at Penn State and Rob DeConto at the University of Massachusetts, Amherst, showed that adding a couple physical processes to their model of the Antarctic ice sheets caused it to produce significantly more sea level rise this century. In their simulation, shrinking Antarctic glaciers raised sea level by a full meter by 2100—and things only picked up from there. These simulations were much closer to hypotheses than to iron-clad predictions. The model showed these processes—the collapse of ice cliffs above a certain height and pressure-driven wedging apart of ice crevasses by meltwater—could make a huge difference. 2018-10-24 geographyAmusing Planet, Antarctica, geography, Ice, Natural Wonders, societyM.C. Nature follows specific laws, but results are often irregular and asymmetric like clouds and coastline and ocean waves. So when NASA scientists flying over the northern Antarctic Peninsula last week as part of Operation IceBridge spotted a neatly cut rectangular piece of iceberg floating amidst a jumble of broken ice, everybody thought it was pretty interesting. While icebergs with relatively straight edges are common, this was the first time anybody has seen an iceberg with two corners at right angles, explained Jeremy Harbeck, senior support scientist of Operation IceBridge.